Today we’re whooping it up in Universal Studios. Having a blast. The conference is finished and now it’s time to kick it with the famdamnily. We’ spent 3 days in Disney and now we’ll spend 3 days at Universal. I aim to be so tired when we get home that I need to sleep for a week. I’m only home for a few days before I flit off to Eat Write Retreat. It’s totally worth it though. Learning so much and having a ball. So far my tummy has behaved relatively well. So if we could get a collective “keep behaving Lunie’s tummy” scream right now I’d really appreciate it. Sooner or later my luck is going to run out. Hopefully not on the way home on a stretch of highway with no loo’s. Before I share the recipe I’d just like to give a huge shout out to some of my bloggy peeps I was lucky enough to spend some time with at Disney. Liz of That Skinny Chick Can Bake hung out with my family and me in the parks. We had a blast and hopefully we didn’t terrify her too badly. She got to know hubs and the hooligans quite well. I was lucky enough to meet Kristen of Frugal Antics of a Harried Homemaker last year at FBF 2012 and we became fast friends. It was so great to see Kristen again and catch up. She made me some brownies that rocked my family’s world. They kept saying how good they were. I honestly think they like her cooking better than mine. They aren’t wrong, the brownies were freaking incredible. Thanks so much for the brownies Kristen. And the 5 pounds I gained shoving them in pie hole. So worth it! I also spent a little (not enough) time with Jenni of Pastry Chef Online, and Cheryl of Pook’s Pantry. I’m telling you these ladies will make you howl with laughter. I adore them both. I met some of my idols too but I’ll fill you in more on that when I return and am coherent enough to recap all that this conference meant to me. 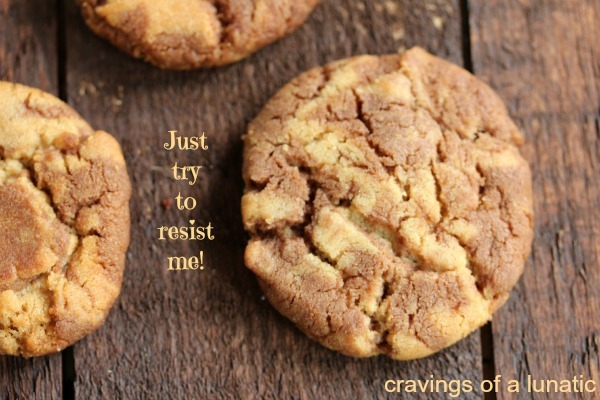 Today I’m sharing a wonderful recipe I concocted for you using Momzie’s Peanut Butter Cookie recipe. I started playing around with it and these got dreamed up. They are the bomb. I used some of my vanilla infused items in this recipe. I talk about them often in recipes so I thought it would be a great time to give some away. So make sure you stick around for the giveaway deets. These cookies were easy to make. You basically just roll out the two kinds of dough, slap one on top of the other, roll them up and cut them. You can also just mash bits together if you are too lazy to roll them out. Whatever works for you. A wonderfully easy way to make cute peanut butter and nutella cookies. Cream peanut butter, butter, and sugars together in a stand mixer (or use a bowl and hand mixer). Blend in eggs and vanilla, mixing well. Add flour, baking soda, baking powder and salt, combine thoroughly. Now divide the dough in half, cover one and set it in the fridge. Using half of the peanut butter dough you just divided stick it back in the mixer, add 1 cup of nutella and give the mixer a whirl till it combines well. Place in a bowl, cover it and stick in the fridge for about an hour. Sprinkle some flour on your work surface and roll out the peanut butter dough. Now roll out your nutella dough. You can do it separately and then place on top. Or if you're lazy like me you can just do it on top of the peanut butter portion and just adjust the sides with your hands if it makes it spread too much underneath. I'm a rebel. Now roll it up. It's okay if it's messy. These aren't called perfect swirl cookies. Once you roll the log up, take a cutter, I used a dough scraper for pizza, and cut them into cookie sized portions. Lay on a parchment lined cookie sheet. Bake for about 12 to 15 minutes, starting to check around the 10 minute mark. Serve with a big old "we love pb & nutella" smile! 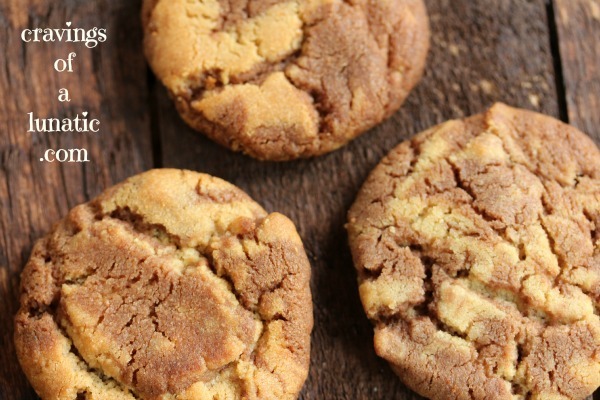 Click to learn how to make Vanilla Brown Sugar! Click to learn how to make Vanilla White Sugar! Click to learn how to make Vanilla Salt! Seriously people I dare you to try to resist these little cuties! Especially hot out of the oven! Okay so on to the giveaway stuffola. Any of you folks who read regularly know I use vanilla infused sugars and salts, among many other flavoured sugars and salts. It’s so much fun to make these things and they just amp up your baking and cooking. So I thought I’d give some away. I’m giving away 1 Vanilla Gift Box to 1 lucky reader. It could be you! I wish I could share a photo of it but my photo card somehow got left behind when we roared off to Florida. So you’ll just have to envision it. Take a minute, clear your thoughts then picture mason jars of varying sizes containing vanilla infused everything. There you go, you have no envisioned the gift box. To enter just leave a comment saying what you would make first with your prize package! Giveaway open to U.S. and Canadian residents only! Giveaway ends Tuesday May 28th at midnight. Winner has 72 hours to respond to email before a new winner is chosen. Good luck. Keeping this one simple for you. One entry per person. Giveaway Winner is Ashley, comment # 65! Having a blast in Florida and can’t wait to tell you all about it next week. I’d like to make vanilla sugar cookies. 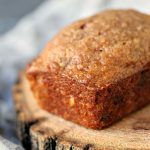 I would have to try using some of the vanilla flavored oats in a Rhubarb dessert to start off the spring baking season! I love that idea. Great use for vanilla oats. I would totally make these cookies first! I sort of love you right now. I’m so jealous. So, so jealous. I’ve seen you guys posting about your time at the retreat and am so jealous. I wish I could have gone. Really, really badly. Maybe some day. These cookies look phenomenal. Even though I’m not a chocolate fan, I adore Nutella and anything hazelnut. Paired with peanut butter? Be still my heart! Have a blast at Universal! We have to get you to one. I’d love to meet you in person. I know right. They are so good. We had way too much fun. I came home exhausted. Probably something new like Vanilla Scones with a vanilla glace. Yum! Sounds like you had a wonderful time! On the way home you might want to schedule a stop in Ocala (about an hour, hour and a half northish of Orlando). It’s one of the major horse raising areas in the US (not Kentucky, but close). Your sort of place. And these cookies would definitely find a place in my stomach! Great stuff – thanks. I would love to visit Ocala. I have some friends who bring their horses down for the winter. Not sure we’ll have time but we’re thinking we might plan a trip next year on our own. Conferences don’t leave a ton of time for other things so a family vacation here with no commitments would be great. I’d love to spend some in Ocala and then some in Jacksonville to visit some friends. Hope you’re well. Can’t wait to get home and catch up on what you’ve been up to in the kitchen. You lucky, lucky women! I’m so envious that you all got to meet. I wish I was independently wealthy and could afford to fly over for events like that. I think we need to work on making you independently wealthy lady. Or at least find you a great sponsor. I’d love to meet you. I think I’d make sugar cookies! I think sugar cookies would be perfect with vanilla stuff in them. 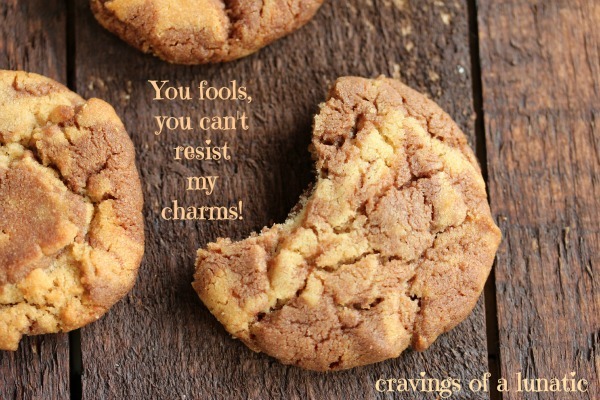 I love cookies that talk back! I LOVE peanut butter and Nutella together! Must have these cookies. I love the idea of a facial mask. And cookies with butterscotch sauce sounds so good. I shall share it next week Nami. I’m still sifting through photos. I may need to make it a 2 or 3 part series there’s so many. Swirling is fun but stressful. I love when it works. Thanks Nami! I would make cookies! Hope you have a safe flight back! Thanks Asiya. We had so much fun. We actually drove, which was exhausting (20+ hours each way) but fun. These swirl cookies are the cutest things ever. And peanut butter and nutella sound like a match made in heaven! I’d prob make some more vanilla extract! I wanted to cry seeing all the Disney fun you guys were having (IWAS/AMSOJEALOUSSSS) and now you’re at Universal too! Ahhhhh I hope you’re having soo much fun! Perfect thing to do with vanilla beans. Ha, it behaved some of the time. Other times not so much. But I muddled through. Had an absolute blast. Thanks so much Ray. Hope to meet you at a conference one day. I would make a vanilla cinnamon Crumb cake. I’d make vanilla bean french toast with caramalized bananas! Oy, I may love you right now. That sounds so good. I love that. Granola rocks, especially hot out of the oven. I’d make my Mom’s sugar cookie recipe!!! They are great cookies and would be even better with vanilla sugar!! That’s a wonderful choice. I bet they would taste amazing. I have to make cookies for a baby shower in June – so definitely sugar cookies. That is a lovely choice. Hope the shower goes perfectly. I’d totally make vanilla creme brulee. 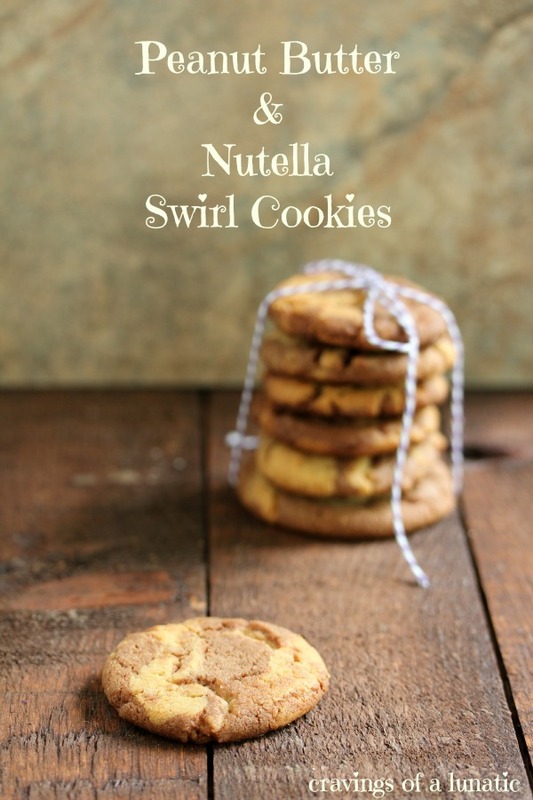 I would make these Peanut Butter & Nutella Swirl cookies first. Thanks for that Candace. You will love these cookies. It sounds like you’re having a blast! Enjoy the rest of your vacation. Hey, Lunie’s stomach. BEHAVE! I can’t wait to meet you in July, Kim. And, these cookies, yum! Thanks so much Jennie. Tummy behaved so-so which is okay by me. I decided to cancel BSP so I can focus on some health issues. I need a big chunk of time to try to get my IBS under control with less meds. So I booked off 12 weeks this summer to focus on that. I’ll miss meeting you. The only other planned conference right now is Mixed in the fall. Sooo tasty, and the swirl is gorgeous! Have fun at Universal, I am jealous! Thanks so much Ashley. I had so much fun. So what do I have to do to get you to bring these to Eat Write Retreat? What if I promise to bring something yummy in return? I’d make a vanilla bean buttermilk cake with vanilla cream cheese frosting! Oh my gosh, that sounds so good. I would make vanilla bean cupcakes! I would make some oatmeal dark chocolate chip cookies. Those sounds like perfection to me right now. 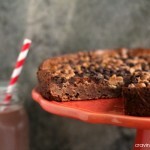 I’m seriously craving something chocolatey. I would try your pb and nutella recipe. You would love it. They are so yummy! I would make vanilla bread pudding. That is an amazing choice, bread pudding is the bomb. I’m so glad you are having fun! And I would make salted vanilla ice cream! With vanilla oat topping! And to gild the lily, a vanilla brown sugar caramel sauce! Plus these cookies on the side. I guess I always had a bit of a brown nose! Oh my gosh, I want to come live with you immediately. Oh that sounds lovely. I love frozen custard. I think I would make this recipe first–it sounds delicious! I’m curious: can cookie butter (such as Biscoff Spread) be substituted for the Nutella? also, will the Vanilla gift box include recipes? I don’t have any experience using the vanilla-infused items (but I love vanilla, so I can only imagine everything being better 😉 Thanks for the giveaway. Hi Natalie. Great question! I think Biscoff would work wonderfully in this but the swirls wouldn’t be as dark. You could also just make a batch of dough with cocoa powder in lieu of the nutella so you would have a chocolate and peanut butter version. Which quite frankly gets my vote and I now want to make them asap but I’m on the road home from Florida and will be stuck in my car for 20 hours. Lol. All the vanilla items can be found on the blog by going to recipe index, click fun experiments and you will find them all. But I’ll be including the recipes on cute little recipe cards in the package as well. Thanks for taking the time to comment and enter. You ask awesome questions. I love that you took the time to reply–thank you very much! As you’ve probably surmised, I’m new to your blog. Looking forward to all the yummy stuff you have in store for your readers. I have Nutella in the cupboard, so I don’t even need to substitute (I’ve just been on a Biscoff quick). After reading “About Me” I’ve concluded that you and I have much in common (No. 10–I hate to have my picture taken! [although I’ve never even been a 4/6–I can’t imagine what that would be like] and No. 15, I don’t like eggs either. In fact, recently, I was so repulsed by them, it interfered with my enjoyment of the goodies I had baked!) anyway, I hope you have a safe trip home. You are so sweet. Welcome to the site and I hope you love it. I love that people connect with the about me. I have such weird quirks for a foodie but I roll with it. If you ever have any questions about recipes feel free to email me. I try to answer quickly, as long as I’m not travelling. I’m thinking a lemon-vanilla oatmeal cookie, yep that is what I’d make! I love anyone who loves lemon as much as me. Perfect choice. I can’t wait till you can join us. It’s so much fun to hang out with other bloggers. I don’t live near any so going away is the only way I can indulge. It’s just good fun. My tummy was relatively well behaved. Now for conference #2. Ugh. I am reading about your trip backwards which is rather strange because I know the end already. The conference really sounds amazing with all those fellow bloggers. What a lucky girl! I am glad Lunie’s tummy is behaving well. Thanks so much Suzanne. I laughed at reading it backwards. That’s hilarious. 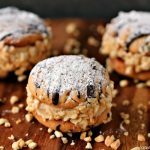 I have Peanut Butter Nutella Swirl cookies on my site, too…and they just so happen to be one of the most requested cookies in our house! Now I need to go make a batch…yum! They are so yummy. I need to zip over to yours and see how you did the swirl. I am not good at swirling. Lol. 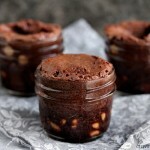 Thank you for the recipe..will be purchasing nutella today to make them! awesome! I wish you could have Helene. I would love to meet you. Good eye, they are my mom’s with a twist. Lol, I love that people are reading backwards. It cracks me up. I think I would make vanilla bean cupcakes first. I have a recipe I’ve never tried, and it sounds wonderful. That would be perfect for sure. I can’t believe you have taken the time to reply to each of us who left comments. That is so nice of you. I’d love to make brownies sprinkled with the vanilla salt! Now I just fell completely in love with you. That sounds so good. I would make 5X vanilla oatmeal cookies, using all 5 of these ingredients in one recipe!!!! although I have been tempted in the past to add some miniature marshmallows to oatmeal cookies to get wonderful little melted vanilla pockets in them. And THEN I might even make some vanilla bean ice cream to sandwich in between a couple of those cookies for some over the top vanilla oatmeal ice cream sandwiches, or maybe make some vanilla cream cheese filling (could use some marshmallow creme here) for the middle and have some amazing vanilla oatmeal cream pie cookies. There is no such thing as too much vanilla! Sounds like you’ve been having a wee of a time!! 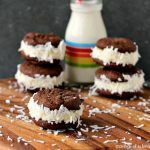 And these cookies sound AH-mazing! Love both peanut butter and Nutella so I know these are amazing. And what a great giveaway!! I would LOVE to win and get to sample all your vanilla creations. Especially the vanilla salt. I’ve never had it before and would love to figure out how to use it. I think the first thing I’d make would be a salted caramel with the vanilla salt. I certainly have. And it continues this weekend at EWR. I may be in a coma by the end of it. Thanks so much Kate. I think salted caramel is a perfect choice. What an amazing trip and so lucky that you were able to meet all those fantastic ladies we adore dearly. Loving these little cookies, anything with nutella to satisfy my craving is always a winner. Thank you. I love nutella. Late to finding it in life, but now I’m addicted. The cookies look fabulous! I have never baked with flavored salts but would love to give it a whirl. Lol Valerie. I had to cancel BSP but EWR is still a go. As is Mixed. I’m taking 12 weeks off so I can focus on some health issues. So sick of feeling sick and letting my ibs rule my life. I sure hope you can get to Mixed or perhaps we could look for sponsors for blogher food next year. That one sounds great. Thank you. I love my flavoured salts and sugars. It’s like a sickness at this point. I’d make vanilla bean ice cream! I love vanilla bean ice cream. Sounds like a wonderful time! Love the cookies! I would make Snickerdoodles and Sugar Cookies. And I will have to make your recipe, it sounds so delicious and I just made some homemade Nutella. Now I just need to win me some sugar. I’d make a good old-fashioned vanilla poundcake! oooh! some of the Vanila Brown Sugar and Vanilla oats crumbled together (along with other ingredients) would be make a perfect topping for Peach Cobbler! yummy! Now you’re speaking my language. Peach Cobbler is one of my faves. Definitely these cookies! I always add extra vanilla to *everything*! Fun giveaway! Thanks so much Michelle. I am the same way. Never too much vanilla in my world. vanilla sugar cookies or bread!! I love both of those things. If they were combined my life would perfect. I was trying to decide when I noticed a previous comment about making waffles… and I was sold on the idea! Num! Definitely waffles!